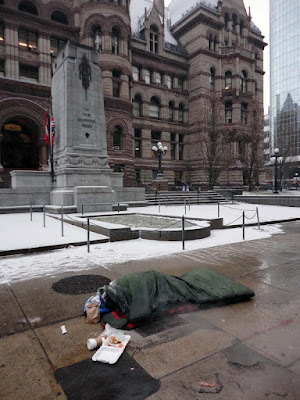 In 2009 the City of #Toronto estimated that there were approximately 400 homeless people on the streets - roughly about half of the numbers found in 2006. 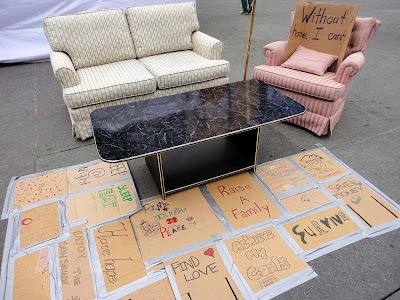 This has been a hard fought battle to get people into homes after City Council committed to ending homelessness in 2005. 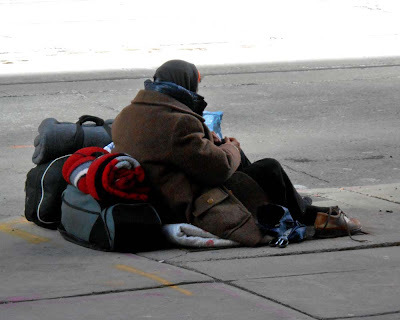 Remember to call 311 or 1-877-338-3398 (toll-free) Central Intake if you need emergency shelter. You can call 311 if you see someone on the street who requires outreach assistance, and 911 in an emergency. 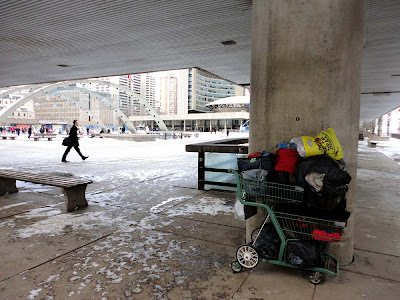 The City's What Housing First Means for People report states that "When asked about the main reason they became homeless, 23% said problems with drugs and/or alcohol and 22% said it was because of some kind of personal trauma, such as a break up of a relationship or death of a family member. This includes 5% who said it was because of domestic violence and 6% who said it was because of problems with their parents. Ten percent said it was caused by job loss, while 9% said it was because of the specific circumstances leading to the loss of housing (eviction, building being sold, etc. 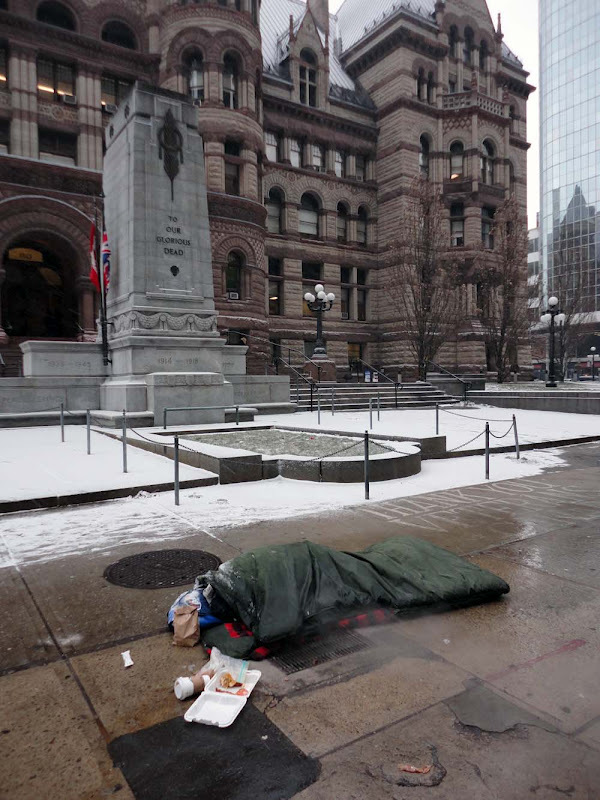 ), and 11% said it was because of a lack of financial resources and availability of affordable housing more generally. 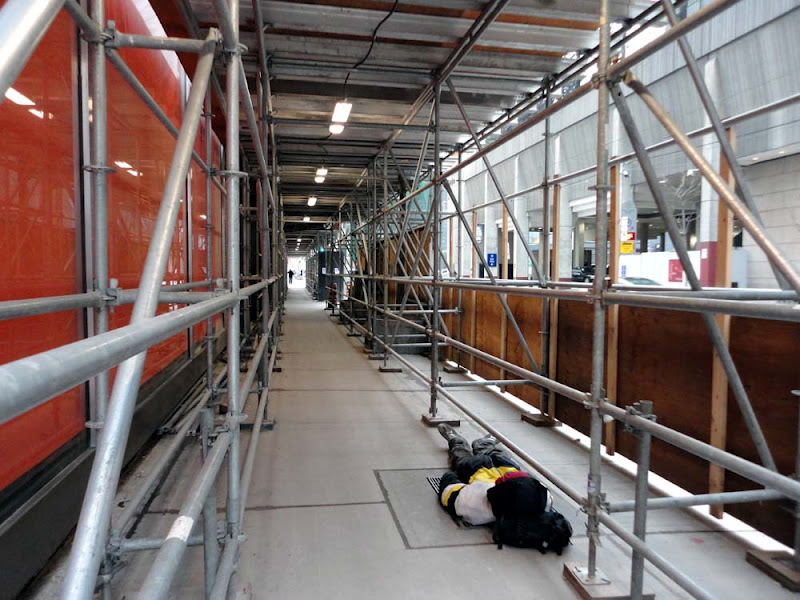 The remaining reasons (19%) cited included moving to Toronto, release from prison, mental illness or physical illness. Only 5% said it was by choice or by their own fault." 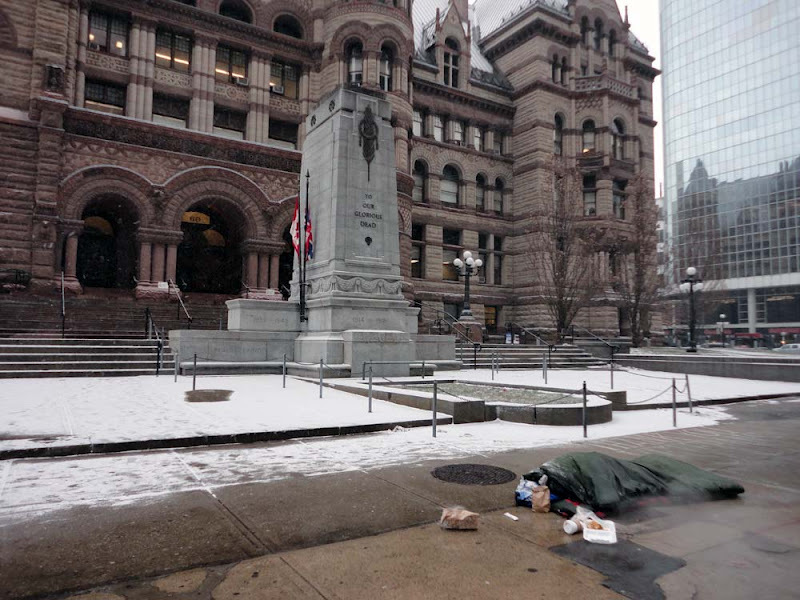 Extensive systems of steam grates on the boulevards help the homeless survive winter in Ontario. 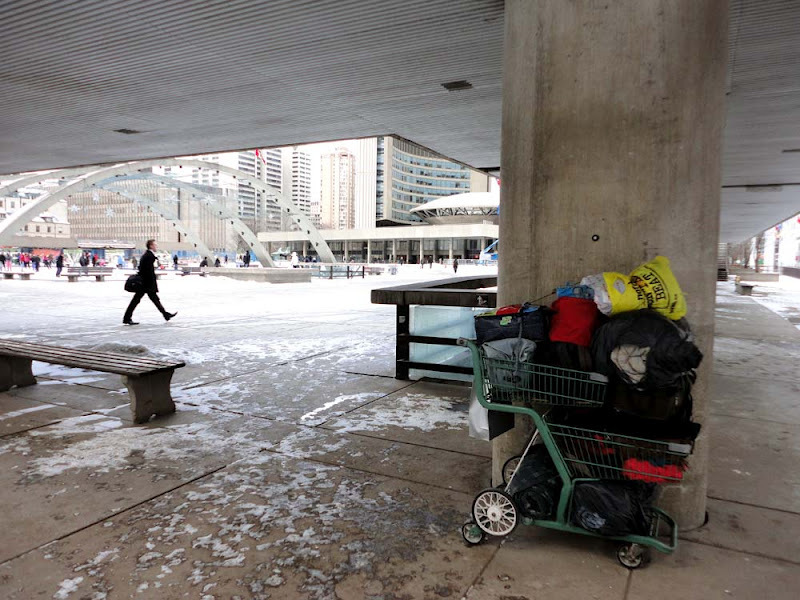 Nathan Phillips Square is a popular place to stay for many, along with the Bay and Queen Street West intersection. 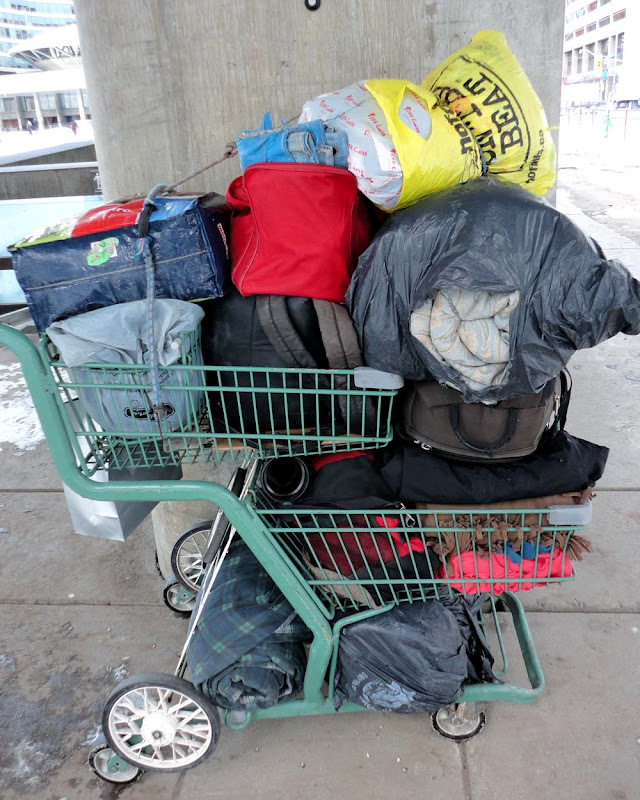 See some of the ways the people of Toronto lend a hand after the jump. Lunch Money Day 12 had volunteers at Union Station collecting donations in the morning and at lunchtime Yonge-Dundas Square you could buy lunch to support the hungry. 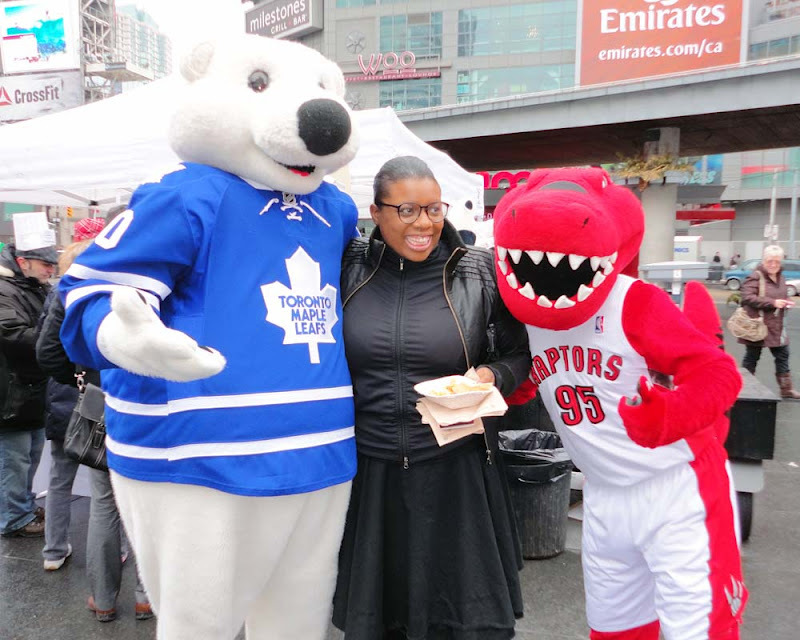 Toronto Maple Leaf mascot Carlton the Bear and the Raptor Mascot joined the chefs and restaurants providing great food in the square. Metro Supermarkets were also giving out free chocolate bars. "Join us for lunch at Yonge-Dundas Square on Lunch Money Day - Thursday, February 16 from 11am -2pm. Chefs from Caplanksy's Delicatessen, Cool Hand Luc, Second Harvest's Harvest Kitchens at the YMCA and L.E.F., Magic Oven Pizza, Real Sports Bar & Grill and Sullivan & Bleeker Baking Co. Metro, a Lunch Money Day sponsor will also be providing delicious samples. The delicious tastings will be available for only $2 to $5. 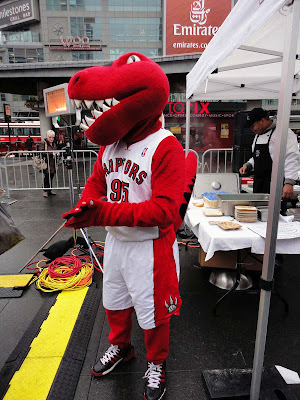 All proceeds raised from this event will go to Second Harvest's Lunch Money Day campaign to help reach our goal of providing 525,000 meals to Toronto's hungry." Tokens 4 Change was another Yonge-Dundas Square event to support Youth Without Shelter. People could donate TTC tokens or change to assist the cause and in 2011 they raised almost $70,000.